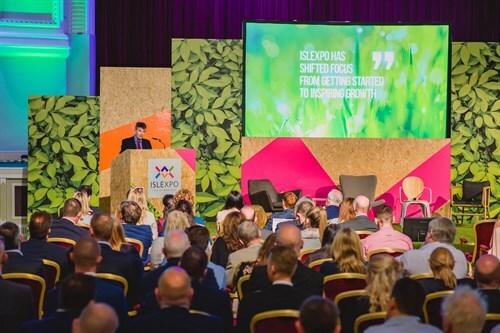 The Island’s biggest and most varied business conference is back for a third year as ISLEXPO returns to the Villa Marina on the 16 May 2018. Created in 2016 to launch the £50m Enterprise Development Scheme, ISLEXPO programme content was originally built around three core concepts aligned to the full spectrum of business support offered by the Department – start, grow and locate. The event has moved through ‘starting’ and ‘growing’ a business and now centres on the definitive theme of ‘locate’ to explore the many benefits of living, working and rooting a local or global business in the Isle of Man. Additional highlights for 2018 will include topics such as attracting and retaining talent, future proofing the Island’s job market, export and expansion, funding options for local businesses and a fresh focus on emerging local sectors such as local food and drink and the creative industries. Delegates can expect an action-packed programme of captivating speakers – including Dan Germain, co-founder of the award-winning drinks brand Innocent -, practical workshops, 1-2-1 business mentoring, funding advice and many opportunities for networking with like-minded business owners and local or off-island attendees. For anyone who can’t make the daytime event, a lively late programme will take place in the ISLEXPO Garden Hub, 5-9pm. Expect entertaining pop-up talks, street food, craft beer and live music from local musicians including Matt Kelly, The Tides, Nicky Naden, The Birds and Beards. All are welcome to attend this celebration in the Villa Marina Gardens. ISLEXPO is hosted by the Department for Enterprise and co-ordinated by local events, sponsorship and marketing agency, Revel. ISLEXPO is free to attend and open to all. Visit www.islexpo.com to register, sign-up to workshops and view the full the programme. ISLEXPO Media Partner Manx Radio will be featuring exciting interviews with speakers and the team involved in the project between now and the event. ISLEXPO Live will be broadcast on Wednesday 16 May.